The National Swimming Center – a landmark building in Beijing known as the Water Cube – turns on its symbolic blue lights on April 2 to mark the 11th World Autism Awareness Day. Yang Qiyong (4th L) touches cells on a large screen to light up the futuristic LED bubbles on the exterior of the Water Cube during the 2018 "Light It Up Blue" event in Beijing, April 2, 2018. It is the only building in China that has participated in the Light It Up Blue activity to observe this special day for eight years consecutively, in a bid to raise people's awareness of this special group of people, most of whom are young. Hundreds of people took part in the activity on the day. Autism is a severe mental illness that affects children and prevents them from communicating normally with other people. There are more than 10 million autistic people in China, and the number is increasing by hundreds of thousands each year. "Normal people feel lonely as well. There is some distance between us and the world. The distance is just a little further for autistic children. 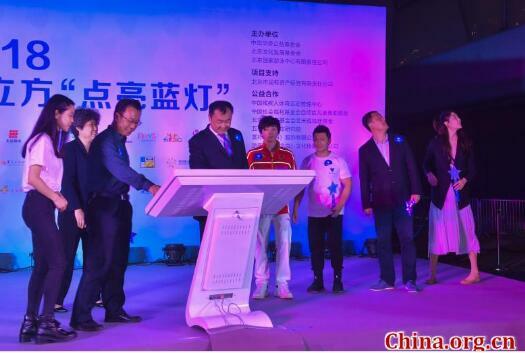 The main difference is that our communication ability is slightly stronger than theirs," said Yang Qiyong, general manager of the NSC and one of the initiators of the Light It Up Blue activity. "We should show more understanding for them, and do something to help," Yang added. Yang organized some small-scale activities with friends, including Light it Up Blue, to raise the public's awareness of autistic children at the Water Cube in 2011. After that, Yang thought to combine the Olympic Spirit with the activity, as the Water Cube was built initially for the 2008 Olympic Games in Beijing. Three years ago, the Light It Up Blue activity was expanded and opened to anyone who wanted to participate, which, Yang said, means it can provide "real help" to the autistic. The Water Cube Welfare Fund was established in April last year to help the disadvantaged group with donations. Yang intends to make the Water Cube a platform for the people willing to help to provide long-term assistance to families with autistic children, as some parents of autistic children complain that many welfare activities are simply symbolic and don't satisfy their true needs. Yang said the Water Cube will offer swim training for autistic people and organize the sale of goods to support families with autistic children alongside other charitable sports activities. Yang said learning to swim is a good way to help autistic children communicate with others, and the Water Cube has the ideal conditions to let them enjoy themselves. "Many volunteers start helping autistic children after having experience in related voluntary activities. They say they have found the softest part of their soul through caring for autistic children,"said Zhou Jing, director of the Autistic Children Relief Fund of the China Social Welfare Foundation and an attendee of the activity. Zhou points out that this is how"real help"comes about. According to the CSWF, the total amount of donations it receives jumped to more than 500 million yuan (US$79.47 million) in 2017, from just 1.6 million yuan in 2008. And statistics from the China Volunteer Service Federation indicate the number of registered volunteers in China ballooned to more than 42 million last year, up 29 percent from 2016. The National Swimming Center, also known as the Water Cube, has sought to provide real help to disadvantaged people in the eight years since its original Olympic mission in 2008.